A thread for news, projects and construction in Dothan and the Wiregrass Region of Southeast Alabama. boy it really bypasses Dothan, I remember they were having intense debates on the pros and cons of having it go downtown. Don't know all the details but it sure would seem better for Dothan if it did. Atlanta architectural firm Lord, Aeck & Sargent was chosen to design the renovation and expansion of the Wiregrass Museum of Art in downtown Dothan. The firm's experience with museums and in renovating historic buildings helped seal the deal. The downtown route would have been a major mistake that would have to be rectified in 50 years or so. Cities all around the country are dealing with blight associated with elevated downtown interstate corridors. The elevated roads often act as a wall of sorts that block urban development often causing blight. I was in favor of the eastern route simply b/c it would have boosted the eastern side's development which has been lagging behind the western side for years. The Dothan Downtown Redevelopment Authority will use a $50,000 appropriation from the city to appraise downtown properties that will likely be demolished. Mayor Pat Thomas said that several downtown buildings are beyond saving, and that the city could create open space and possibly parking by demolishing those buildings. I don't know what buildings the mayor is referring to, but I question whether due diligence has been done to determine the structural integrity of those buildings. This smacks of backward 1960's urban renewal. Downtown Dothan already has too many vacant lots and surface parking lots, and the city certainly doesn't need any more. If these buildings really are beyond saving, then the city ought to get replacement projects solidified before they embark on a wholesale knock-down spree. I don't know what buildings the mayor is referring to, but I question whether due dilgence has been done to determine the structural integrity of those buildings. This smacks of backward 1960's urban renewal. Downtown Dothan already has too many vacant lots and surface parking lots, and the city certainly doesn't need any more. Dothan city commissioners are considering approval of a downtown master plan that includes a new town square at the intersection of Foster and Troy streets. The plan, drafted by the HNTB firm, includes 60 revitalization recommendations, including the new town square, removal of angled parking along Foster Street, a two-level parking deck at the northeast corner of Foster and Troy streets, sidewalk expansions, and enhanced crosswalks for pedestrians. Public hearings will be held before the city commission votes to formally adopt the plan. If this is done right, downtown Dothan could really improve over the next few years. I'd really like to see this master plan. Abbeville's WestPoint textile mill is closing after 54 years of operation, costing the city of 2,963 almost 600 jobs. A company spokesperson said the closing is due to "global restructuring." WestPoint bought textile companies in Pakistan and Bahrain last year. Movie Gallery financial troubles resulted in a 44 percent drop in company stock, and the Dothan-based company may be put up for sale. The company plans to continue cost-cutting efforts, including store closures and consolidations. The larger cities in the Wiregrass are showing marked growth thus far this decade. According to 2006 census estimates, Dothan's population increased 10.3% between 2000 and 2006, from 58,071 to 64,053. The population of Enterprise increased 11.6%, from 21,183 in 2000 to 23,653 in July 2006. Dothan grew by 9.2% between 1990 and 2000. At its current rate, the city is on track to see 15% growth between 2000 and 2010. The Dothan City Commission will discuss the future of the Dothan Civic Center at a Tuesday meeting. The civic center, which opened in 1974, is too small and in need of expensive repairs and improvements. Commissioners may consider replacing the civic center rather than funding repairs. A recent review by an architect showed that the existing arena cannot be expanded. According to officials, Dothan missed out on hosting several basketball tournaments because the arena was too small. Edit: Dothan city commissioners discussed the civic center, but no one seemed ready to start build a new one. Dothan Mayor Pat Thomas said he would like to add banquet space to seat 1,000 people on the north side of the building, to free up the arena for more events. A state-of-the-art $18 million library could be a key ingredient in the revitalization of downtown Dothan. However, a local group that may help fund the project wants a suburban location, with convenient automobile access and parking as their primary concerns. Hopefully, the main library will remain downtown so that it will be accessible to all, not just those who drive cars. A satellite library could be opened in a retail location on the circle. The Dothan Planning Commission voted to approve the new downtown master plan, which must now be voted on by the city commission. The master plan includes recommendations for making downtown more pedestrian-friendly, adding green space, building a parking structure, implementing zoning overlay districts, creating a town square and improving crosswalks. Branding downtown to create an image as a cultural arts destination was recommended, as well as gateway features to help identify downtown for visitors. 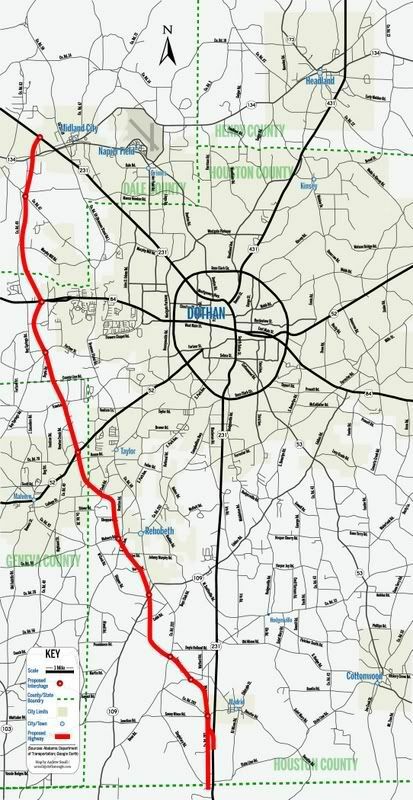 Before moving forward with widening the Ross Clark Circle from four to six lanes around Dothan, ALDOT is studying how the proposed I-10 connector would affect Circle traffic. If the I-10 connector would displace enough traffic to alleviate congestion on the circle, then ALDOT may use circle widening funds to jump-start the connector. Currently, the circle project is set to begin next year, but it may have been pushed back all the way to 2012 or later. Costs for the circle project have skyrocketed, from an original estimate of $10 million almost twenty years ago to now, when right of way acquisition alone will probably exceed $50 million. ALDOT began studying possible improvements to the circle in 1985, and the first plans were proposed in 1990. Once again, ALDOT's foot-dragging will cost the taxpayers tens of millions of dollars. The Wiregrass Transit Authority plans to implement a study to explore the needs and feasibility of a fixed route bus system. The WTA currently operates an on demand bus system. Officials see the public transportation system getting busier as the population ages and people live longer, and increased ridership could help justify a fixed route system.